Analysis Data protector Acronis is building hyperconverged infrastructure (HCI) kit for release in 2019 and developing a security product slated for 2020 – markets in little danger of being under-served. A slide extract from one of its recent presentation decks illustrates the plan: Acronis will build a base using service providers and SMBs before going into the general storage/HCI, Azure Stack-style, virtual and hardware appliance area. Judging by the slide, its security product strategy appears to be generally the same as its HCI strategy: build a product base with service providers and SMBs and then create a larger business off the back of it the following year – so it's a product in 2020 and a business in 2021. But, actually, the data protector told The Register, it is not planning full-on frontal attack on the HCI and security product businesses out there. Acronis president John Zanni explained that Acronis was taking aspects of its existing data protection product and providing HCI and security instantiations of it. The company has 500,000 SMB customers, five million-plus consumer customers, many OEM licences and 50,000-plus channel partners - with 72 distributors. It basically sells data protection software, along with ransomware protection and blockchain-based data validation (Notary). It sells both on-premises and to cloud service providers – the strategic focus. Acronis is incorporated in Switzerland, privately owned and has its internal headquarters in Singapore. The annual revenue run rate is around $200m. The firm claims its on-premises software business is in the low double digits, say 10-15 per cent, and the cloud business in the high double-digits – over 80 per cent. The cloud service provider business should surpass the on-premises business in the 2019/2020 period, given current growth rates. It wants to develop a scalable, efficient, easy to use backup target appliance, using this code base, for its CSP customers. And it needs to provide disaster recovery (DR) – and that requires a DR target system. 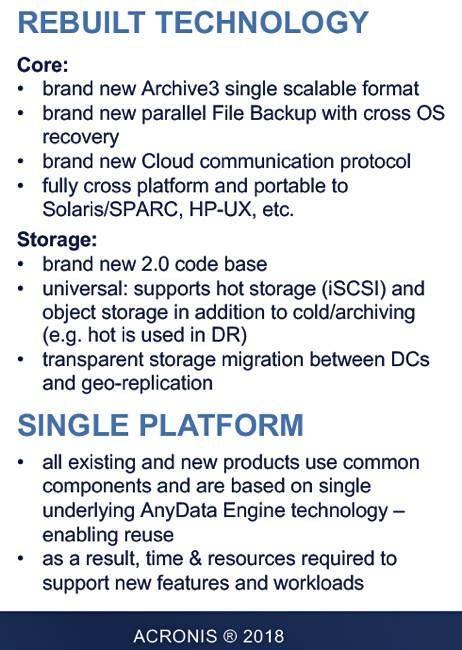 This is the Acronis HCI product, purpose-built for data protection, and it will use Acronis's Virtuoso hypervisor. Zanni told us: "You can't have DR unless you have compute." For SMBs it's on-premises, but for CSPs it's multi-tenant and delivered as a service. File sync-and-share functionality, as you'd expect, is on the roadmap for the HCI product. Acronis also wants to take its existing ransomware protection feature and use this as the basis of a security product – security in the sense of securing the backup data. No way does it wish to enter the antivirus or general malware protection markets, so AVG, McAfee, Kaspersky and the gang needn't lose any sleep. The firm will move into enterprises from its SMB base by initially concentrating on edge devices – tablets, mobiles and desktops – and edge locations – remote and branch offices. We can see here a steady couple of adjacent market moves by an established backup supplier. It's not a startup but nor is it a staid old, long-term enterprise incumbent being shook up by Cohesity, Rubrik and Veeam. By no means is it equal in size to Commvault, a $600m-plus run rate company, nor Veritas, nor the $350m run rate Barracuda (before it went private), or Rubrik, at $300m – but it is comparable to Carbonite in run rate size.